Boston is a city filled with pedestrians. Students, workers, residents, and tourists comprise a large contingent of pedestrians that take to Boston streets each and every day en masse. Boston has even been called ‘Americas most walkable city.’ Sadly, Boston pedestrians are struck by motor vehicles time after time. These personal injury accidents can result in tissue injuries, fractures, scarring, and even death can result when inattentive drivers strike pedestrians. Boston pedestrian accident lawyer Christopher Earley has successfully handled many of these cases. These accidents can occur anywhere, but frequently occur in or near crosswalks. It is important to know what your rights are if you were struck as a pedestrian by a motor vehicle, regardless if you were inside or outside of a crosswalk. According to the Insurance Institute for Highway Safety, most pedestrian accidents occur in urban areas. This makes sense, especially in a congested city like Boston, where there is a high concentration of pedestrians and cars. Further, the most common type of pedestrian accident is when a pedestrian is hit by a vehicle traveling straight. This type of accident tends to happen most frequently on roads with speed limits less than 40 mph, and about half occur at intersections. Further, most pedestrian accident deaths tend to occur in rural areas as cars in these areas are typically traveling at higher speeds than they do in urban areas. In 2015 roughly 5376 pedestrians were killed by motor vehicles. There were also more than 70,000 total pedestrian accidents caused by motor vehicles in that same year. The total cost of pedestrian injury among children ages 14 and younger is $5.2 billion per year (Pedestrian and Pedalcyclist Injury Costs in the United States by Age and Injury Severity). A large number of Massachusetts pedestrian crashes occur in or near crosswalks. Massachusetts law requires all motor vehicle operators to slow down and use great caution when approaching a crosswalk. Even if you were hit outside of a crosswalk, the driver may still be liable to you. These accidents that occur outside of a crosswalk typically revolve around whether or not the motor vehicle operator had sufficient time to avoid striking the pedestrian. Massachusetts pedestrians frequently have the advantage in these cases because of the legal protections afforded pedestrians against motor vehicle operators. I am a Boston pedestrian accident lawyer with significant experience with these cases. We offer completely FREE consultations. We only get paid if we win your case. That is called a contingency fee. If we don’t win, we don’t get paid. What does a Boston pedestrian accident lawyer do? We begin working on your case immediately. We take of everything so all you have to focus on is getting better. We handle all communications with the insurance company, and collect all documents and medical records that are related to your case. We then begin negotiating with the insurance company to get you maximum compensation for your injuries. Do I have a case if I was hit by a car? It depends on a number of factors. Generally, as long as the operator of the car that hit you had a reasonable chance to avoid striking you, then you have a case to pursue. Negligence needs to be shown before the motor vehicle operator can be held liable for your injuries. That depends on factors such as: whether you were responsible for being hit by the car; the injuries you sustained; the amount of your medical bills; the amount of lost time from work; whether you have any permanent injuries from the pedestrian accident. Probably not. The vast majority of Massachusetts pedestrian crash cases settle without the need for going to trial. 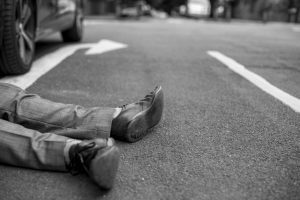 Is a pedestrian accident settlement taxable? You don’t owe any state or federal taxes if your case settles. The car insurance company for the person who struck you is responsible to pay for your “reasonable and necessary” medical bills following the accident. This is called Personal Injury Protection (PIP) benefits. These benefits pay for ambulance, hospital, and all other follow-up medical treatment related to the accident. Your private health insurance company may also be responsible for paying your medical bills you incur following the accident. Who Pays Your Lost Wages? PIP is also available for lost wages. If you lose time from work then the car insurance company for the person who hit you is responsible for paying 75% of your gross lost wages that result from the accident. Necessary paperwork must be filled out by your employer to establish the amount of lost wages you sustained. Another source of recovery for you is for pain and suffering. This is non-taxable money paid to you for the physical and mental distress caused by the accident. Please note your accident-related medical bills must be at least $2000 to collect pain and suffering damages. If you have less than $ 2000 in medical bills, but sustained a fracture, or scarring, then you can still bring a claim for pain and suffering. We recently obtained a $100,000 settlement for a pedestrian struck by a car who developed serious personal injuries as a result. We also recently recovered a $ 100,000 settlement for a toddler that was hit by a car who had a good recovery from his injuries. We were able to also recently obtain a $ 87,500 settlement for a mother hit in a crosswalk by a car while she was pushing her baby’s stroller. Contact Boston pedestrian accident lawyer Christopher Earley and read about our office’s successful case results for our pedestrian clients struck by motor vehicles. We offer completely free, no-obligation consultations. Call to get started with your case if you were negligently injured in a Boston pedestrian accident.